Why Earn a Master’s Degree, 100% Online? Online master’s degrees can help professionals stand out from their peers and provide the skills and knowledge needed to advance their career opportunities and increase salary potential. Earning a respected master’s degree online from regionally accredited Florida Tech can open many doors, including opportunities to make a career change or grow within your field, without having to put your life on hold. Florida Tech offers master’s degree programs, 100% online, in several academic disciplines including Information Technology, Finance, Business Administration, Project Management and more. Here are some benefits to earning a master’s degree online. Students are able to immediately apply new strategies and tactics at their jobs due to the fast-paced, dynamic nature of online education. Also, being an online student provides students with the soft skills that are in-demand in the workplace, including time management, communication, collaboration, teamwork, critical thinking, problem-solving and ability to multitask. Professionals who hold a master’s degree earn a higher median salary than those with less education, according to the Bureau of Labor Statistics (BLS). In fact, graduate degree holders earn 19% more than those with a bachelor’s degree. Additionally, master’s degree holders are less likely to be unemployed compared to those with only a bachelor’s degree. Earning a graduate degree can help job candidates remain competitive, not only in professions that require graduate-level education, but in careers with fewer education requirements. 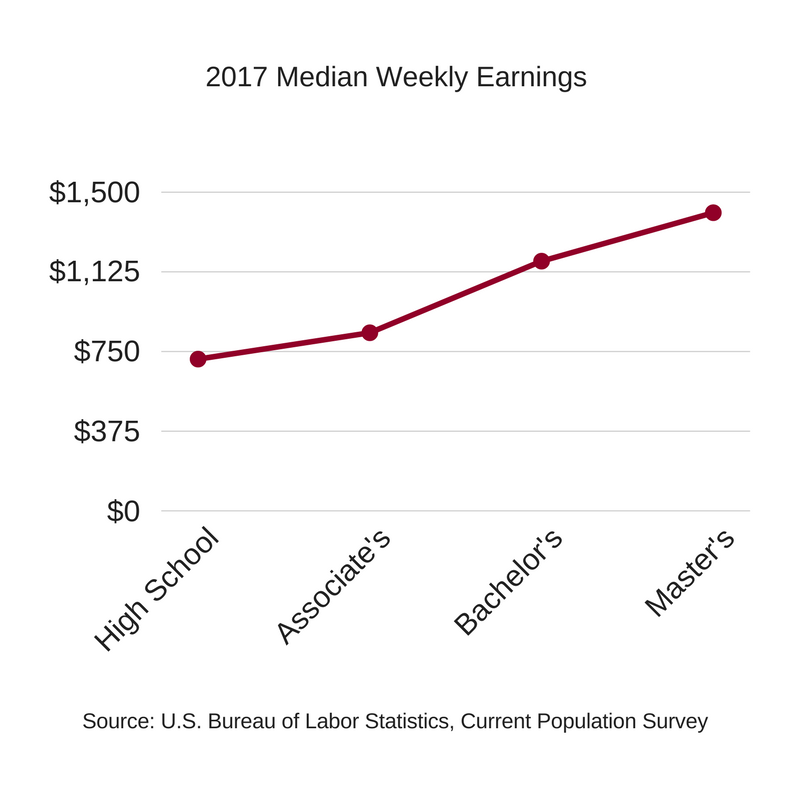 For example, the BLS reports among all occupations in 2013, business, financial and sales positions had some of the highest earning premiums for those with a master’s degree. Florida Tech’s online classroom features interactive, media-rich courses which include informative videos, discussion boards and chat rooms for students to connect with faculty and each other. The online master’s degree does not require on-campus attendance or specific login times, which allows students juggling a career, family and more, to complete coursework and materials at your own pace. Florida Tech is considered a pioneer in the fields of space and technology and is proud to have trained many NASA scientists and astronauts. Alumni who have completed the main-campus or online graduate degrees can find themselves in good company, ranging from corporate presidents, vice presidents and CEOs of well-known companies to high-ranking members of the military. Florida Tech, a U.S. News & World Report Tier 1 Best National University, also received accolades in 2018 from U.S. News for Best Online MBA Programs and Best Online Graduate Business Programs (excluding MBA). Florida Institute of Technology is accredited by the Southern Association of Colleges and Schools Commission on Colleges to award associate, baccalaureate, master’s, education specialist and doctoral degrees. Students who earn a master’s degree from Florida Tech receive the same high-quality education and earn the same diploma as main-campus students and can even walk in their graduation ceremony. Applicants interested in pursuing an online master’s degree from Florida Tech must have a bachelor’s degree from a regionally accredited university. Florida Tech University Online does not require students to take a graduate school entrance exam (GMAT or GRE) to be accepted into a master’s program.